The kitchen table I grew up with, which is now my dining room table, is pocked with scorch marks from Hanukkah candles. My sisters and I each had a brass menorah and we lined them up on a foil-covered cookie sheet to protect the table from dripping wax, but they sometimes tipped over anyway. The smell of smoke as the candles melted down and blinked out and the feeling of the wax we pried out of the candle holders with lobster pickers is my most indelible Hanukkah memory. We ate latkes with sour cream, applesauce, and cinnamon, peeled the gold foil off of chocolate gelt in net bags, and exchanged gifts. Hanukkah and Passover were our major family holidays, although we usually acknowledged Rosh Hashanah with some apples and honey. We were raised secularly in rural Maine, and my parents chose to celebrate holidays with us that involved food, gifts, or changing seasons. We didn’t belong to a synagogue, and although there was a Jewish community group a few towns away, we preferred celebrating holidays at home in our own way. We were raised believing in mitzvahs and were taught to be kind, helpful, and nonjudgmental. So when my youngest sister mentioned to her teacher that she was the only Jewish student in the class, and her classmates thought of ways that they were each also unique, my mother was inspired to write a book to further the ideals we were raised with. She had been writing for a while, starting with newspaper columns about my seventh-grade foibles and then becoming a regular contributor to Spider and other children’s literary magazines. She wrote a book called “Kids Will Be Kids,” a list of reasons not to have children (thanks, Mom! ), but her dream was to be a children’s author. “The Only One Club” was published in 2004. It’s the story of Jennifer Jacobs, who, like my sister, realizes she’s the only Jewish kid in her class when it comes time to decorate her first grade classroom for the holidays. She celebrates her uniqueness by making an “Only One Club,” which she’s the only member of, until her classmates realize that they are each unique as well. They make a club of individuals, including their teacher, who by the end of the book is the “only one” not in the club. My mother never intended it as a Hanukkah book, and says it could have easily been written using other examples of how we’re all the only ones of something and more importantly, members of the human race. READ: Where are All The Jewish Homeschoolers? It’s become a new Hanukkah classic, though, endorsed by PJ Library, the Anti-Defamation League, and even A Mighty Girl as an important holiday read for young children. It was recently translated into Chinese. I sometimes read it to my younger students around the holidays, too, when I’m asked to visit classrooms and explain my holiday traditions. We’re just establishing our family Hanukkah traditions. 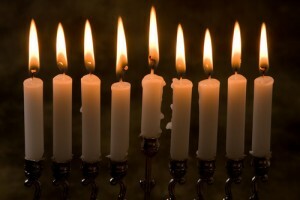 Last winter, my daughter Penrose was just old enough to gaze into the candle flames that topped the same brass menorah I used when I was young. This year, at 19 months, I imagine her pointing and saying, “Hot! Hot!” She’ll definitely open a few presents when we visit my parents. And I’ll make some latkes the same way my mother always does. Then we’ll fly to California and have tamales for Christmas with my husband’s Guatemalan family. Penrose’s holiday traditions will be a unique hybrid, and I hope she’s proud to be the “only one” in her special club.